Just off the M40 and only 15 minutes from the airport, Castle Bromwich Inn Birmingham is a comfortable, affordable alternative to the expensive hotels in the airport grounds. Not only is it one of the cheapest Birmingham airport hotels, it's made even-better value by a handful of free extras - there's free parking during your stay, free wifi and even free papers at reception. More than anything, you'll be impressed by this comfortable, colourful hotel, which offers so much for your money. 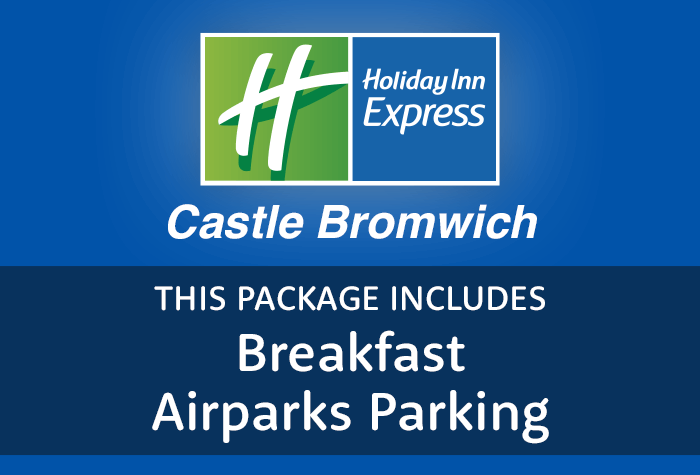 The Holiday Inn Express Castle Bromwich is around 15 minutes drive from the terminal. This package includes parking at Airparks for the duration of your trip. Guests tell us the rooms are bright, clean and cosy. Wifi is free, guests tell us its a good speed and has a stable connection throughout the hotel. The Great Room restaurant offers a range of different pizza, including four cheese melt and pepperoni plus. The hotels bar serves beers, wines, spirits and soft drinks, as well as tea and coffee. Open 11am - 2am daily. Breakfast is included at this hotel. Its an English and continental buffet, served in the great room restaurant. Served between 6am - 9.30am. 7am - 10.30am on weekends and bank holidays. Disabled facilities The hotel has four rooms suitable for guests with less mobility. These all have emergency pull cords and easily accessible toilets.